For those who are looking for a roulette system that risks less than the ever-popular Labouchere Roulette system, the Fibonacci roulette is a good alternative. 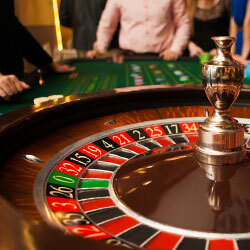 This method of betting on roulette requires a smaller increase in bet size from spin to spin. As a result, you will lose less, but it does require more time to make back losses when you hit a losing streak. To calculate the numbers for the Fibonacci sequence, you simply add the previous two numbers together. So as you can see above, you add 1 + 0 to get 1. Then, you add 1 + 2 to get 3 and continue onward. This sequence of numbers is derived from natural sciences and was originally formulated to determine the length of time that it would take for rabbits to produce a set number of offspring. Once you understand what the Fibonacci system is, it becomes rather easy to use the Fibonacci roulette method whether you’re at a brick and mortar casino or playing at an online casino. All that you need to do is follow the sequence to make your bet. When you place your first wager, you would bet 1. Then, if you lose, you would bet 1 again. After a second losing spin, you would bet 2 units, and following a third losing spin, you would bet 5 units, continuing through the sequence through 5 units, 8 units, 13 units and onward. For easy tracking, you can keep the Fibonacci sequence written on a piece of paper or saved on your smartphone to refer to as you go. As you start to win, the Fibonacci system becomes a little more complicated. If you are fortunate enough to win on the very first spin, you would just start over. When you win, you cross off the last two numbers in the Fibonacci sequence and play again, adding numbers as you lose and taking two off when you win. You would reach profitability when you have managed to cross off all of the numbers on the Fibonacci sequence. Let’s take a look at a short example of how you would use the system at the roulette table. You bet 1 unit and lose. You write 1 on your paper. You bet a unit and lose. You now have 1 1 written on your paper. You bet 1 plus 1 or 2 units and lose. You now have 1 1 2 written on your paper. You bet 1 plus 2 or 3 units and lose. You now have 1 1 2 3 written on your paper. You bet 1 plus 2 or 3 units and win. You now cross off the 1 and 2 and have just 1 written on your paper. You bet 1 unit and win. You cross off the last 1 and you have finished the series. You also have more money than you began with. The main problem with the Fibonacci system is that it does not account for the odds of winning at the roulette in any way. You are simply using a method of tracking how much you have won and lost, so that you can recoup money and know when you have come out ahead. The roulette system really doesn’t amount to much more than betting the same amount of money on one outside bet every time. In the end, it is ultimately up to luck whether or not you would win. Still, the system does involve less risk than the Labouchere Roulette system, so if you want to use a strategy and practice at an online casino, it is a good one to try.